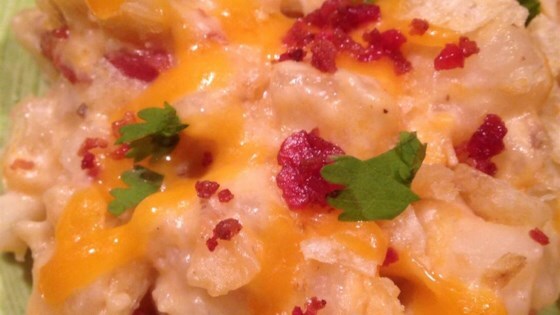 "This is a delicious cheesy side dish! It goes great with everything and is simple to make. Simply delicious!" Stir Cheddar cheese, hash brown potatoes, sour cream, cream of chicken soup, onion, and 1/2 cup melted butter together in a large bowl. Pour into prepared baking dish. Bake in the preheated oven for 45 minutes. Stir crushed chips and 1/2 cup melted butter together in a bowl; spread over hash browns mixture. Bake until casserole is bubbling and topping is golden, about 15 minutes more. If you choose not to use the topping, just bake the potatoes for about an hour. You can also turn up the oven to 400 degrees F (200 degrees C) if you want it cooked faster. It is delicious with or without the topping! I followed to a T and yet it still tasted only like sour cream and was really runny.